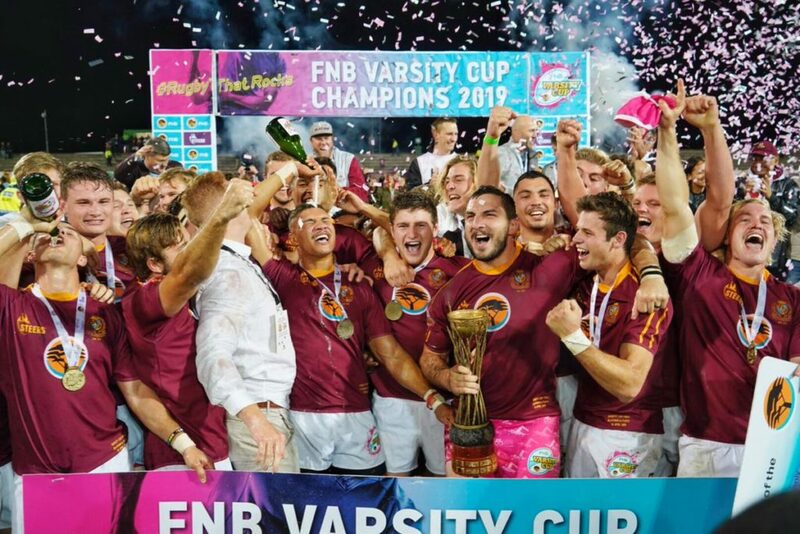 It is Maties’ fifth Varsity Cup title, and Hawies Fourie’s charges have not lost a Varsity Cup game since the 2017 final when they were beaten by Tuks. 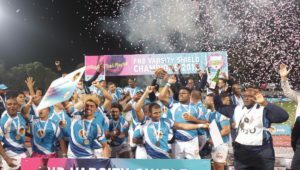 Both flank Johann van Niekerk, who put in an incredible shift in the tight-loose, and wing Munier Hartzenberg scored braces, while flyhalf Jordan Chait boosted the scoreline with two late penalties. Tuks were aggressive from the off and threatened a comeback in the second half when Dewald Naude scored a quick-fire double, but their efforts were ultimately undone when fullback Vaughan Isaacs was sent off for a dangerous tackle. The home side turned down an early opportunity to kick at goal and went for the maul, a decision which paid off as Van Niekerk went over for the opening try in the fifth minute. Tuks continued to withstand the early Maties onslaught, but struggled to make any inroads into the defence, with the Maroon Machine’s loose trio causing havoc at the breakdown. Maties continued to dominate possession and extended their lead when centre Chris Smit produced the goods at pivot for the umpteenth time this season, chipping a cross-field kick to wing Munier Hartzenberg, who plucked the ball out of the air and stepped past his tackler to score and see them go 12-0 ahead at the break. Chris Smit has been doing this all season! Corner kick and it’s Munier Hartzenberg who collects and steps inside to score the @maties_rugby second try of the final! Maties picked up where they left off in the second half as some good hands from Hartzenberg allowed Van Niekerk to finish in the corner for a seven-point try, excellently converted from the touchline by Chait. 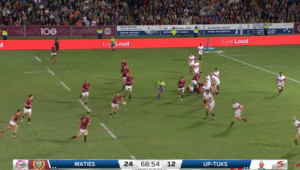 Tuks needed to score next to stay in the match, which is exactly what they did, when after a number of phases in the Maties 22, wing Dewald Naude scored in the corner to make it 21-5. That try seemed to give Tuks plenty of confidence as they started seeing more of the ball, and got their second minutes later when Naude crossed for his brace. 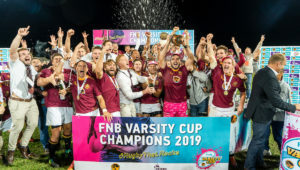 However, the visitors’ hopes of a comeback received a massive blow when Isaacs was red-carded for a head-high, no-arms tackle on Maties replacement Brendon Nell, leaving Tuks with 14 men for the final 15 minutes. Chait ensured Maties took advantage of their numbers by slotting a penalty to take them to a 12-point lead. The result was sealed when Hartzenberg chipped a ball ahead and won the race to dot it down for his second. 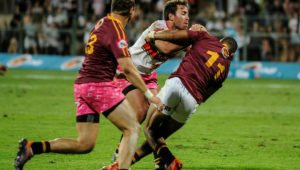 Maties – Tries: Johann van Niekerk (2), Munier Hartzenberg (2). Conversions: Jordan Chait (3). Penalties: Chait (2). 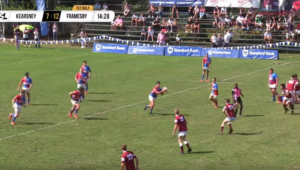 Tuks – Tries: Dewald Naude (2). Conversion: Tinus de Beer. Maties – 15 Reinhardt Fortuin, 14 Munier Hartzenberg, 13 David Brits, 12 Chris Smit, 11 Edwill van der Merwe, 10 Jordan Chait, 9 Remu Malan, 8 Stephan Streicher, 7 Chris Massyn, 6 Johann van Niekerk, 5 Ben-Jason Dixon, 4 Zirk Jansen, 3 Sazi Sandi, 2 Daniel Jooste, 1 Wayrin Losper. Tuks – 15 Vaughan Isaacs, 14 Dewald Naude, 13 Lourens Pretorius, 12 Erich Cronje, 11 Irvin Ali, 10 Tinus de Beer, 9 Theo Maree, 8 Denzel Hill, 7 Hanru Sirgel, 6 Stephan Smit, 5 Ruan Nortje, 4 Marius Verwey, 3 Jean-Pierre Smith, 2 Johan Grobbelaar, 1 Etienne Janeke.